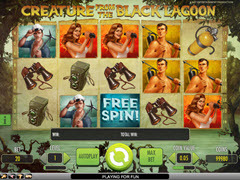 Creature from the Black Lagoon Pokie Review - Play today! 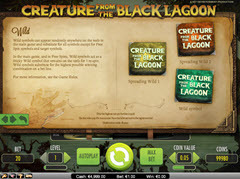 A slot based on a movie, Creature from the Black Lagoon offers 20 paylines which are spread on 5 reels. The game’s designer is Net Entertainment, a company that gives player a chance of winning a $3,750 top jackpot, with features being the wild, the scatter and free spins. This adaption of the movie into a blockbuster video slot will have you recalling the mystery around this infamous creature and the television shows that focused around it during the 50’’s. This slot is ready to give you the action direct from the lagoon and the opportunities it presents are endless. The movie with the same name as this slot has been around for a very long time, almost six decades, but it still has its fans, and now it also has a slot with the same theme. The theme has that kind of design that was popular in the 50’s, with cartoon style characters, including a girl that looks like a pinup model. There are three wild symbols in the game, each one marked with the logo in a different color (green, yellow and orange). The last special feature is the Free Spin! symbol. The regular symbols of the game include four characters from the movie (David, Kay, Lucus and Carl), plus four objects they used (the scuba diving knife, the camera, the scuba tank and a pair of binoculars). The game’s wild symbols, when they appear, will try to help form winning combinations. These symbols are of the sticky kind, meaning that when they show up they remain in that position while the rest of the reels spin again, giving the player a second chance to form some extra combinations. The game also gets free spins, via the scatter symbol marked with the Free Spins! text. Depending on how many of these scatters appear, the number of free spins will vary. 10 spins are given for free when there are three scatters, while four scatters will award 15 spins and five scatters will give away 20 spins for free. The free spins do come with some extra features, like the Target symbols which are collected, or the Spreading Wild. The top jackpot is awarded by the girl character, called Kay, and the total amount is 750 times the line bet, or $3,750. Five symbols are needed on the same active payline, in order for that top jackpot to be given to the player. It’s a well made slot, with a theme that will be mostly appreciated by those that enjoyed the movie as well. The game’s jackpot and theoretical payout percentage don’t recommend this slot as a must play though.